In the previous episode, Barry tried to get his speed abilities back by exposing himself to the particle accelerator again. But instead of becoming the Flash once more, Barry dissolved! How will Team Flash bring Barry back? And where did Barry actually go? Let's find out. Team Flash stands around the particle accelerator containment cell in disbelief. Barry is gone. Harry immediately apologizes; even he is astounded at the turn of events. Cisco tries to figure out a solution, something to bring Barry back, but it's hopeless. Harry calls Jesse to check up on her and Wally, but there's no response. They search STAR Labs and find Jesse and Wally unconscious in the hallway outside the secret room. Wally wakes up, but Jesse's heart has stopped. Harry freaks out, yelling her name. Joe runs to find Henry so he can help Jesse while Iris tells Wally that Barry is gone. Back in the containment room, Cisco vibes using Barry's suit. He sees Barry standing in the middle of a lightning storm--the speed force. Barry is alive. Cisco: "I saw him. I saw Barry. He's alive." Barry wakes up in his bed at home--his childhood home. He looks around at the toys and science-related items that decorate the room. (There's a book on the shelf with the title The Runaway Dinosaur.) He goes downstairs to find Joe crouching by a crime scene in the front hall. He stands up and greets Barry but then tells him he's not Joe, that none of this is real. Joe says "we" thought Barry would be more comfortable talking to someone he knew in a place he was familiar with. "We" is the Speed Force. Barry: "So you're saying I'm--I'm talking to the source of my power, which just so happens to look like... my adopted dad? That's trippy." Speed Force (as Joe): "We pretty much invented trippy here." Cisco tells Team Flash about his vibe. Harry says Barry is in the Speed Force. (How did he know? How?!) Joe comforts Henry, who is very angry and distraught about losing his son again. Joe convinces Henry to look after Jesse, since he's the only one who can because Caitlin isn't there. Henry says Jesse is fine but she's not waking up. It's exactly like when Barry was in his coma. (Oooh, I'm excited now!) Harrison Wells--the one who turned out to be Eobard Thawne--treated Barry while he was in the coma, so Henry sends Cisco and Iris down to the morgue to find out what Wells' treatment was. Cisco: "They'd be downstairs in the storage room in the morgue." Iris: "Eww, you guys have a morgue?" Cisco: "Well, it's not like a morgue morgue. It's not--it's like a poor man's morgue, really. Morgue-ish." In the morgue, Cisco and Iris blunder around looking for information. (This is the greatest. I love their dynamics. It's so fun!) But then a zombie meta-human awakens and starts wrecking havoc. The meta-human is Tony Girder, the metal man who happens to be the first guy Barry had to defeat as the Flash. (That's oddly coincidental.) Iris tries to reason with him, but he's a zombie. He flees STAR Labs and goes into the city. Barry: "If you would rather have given these powers to somebody else, why did you give them to me?" Speed Force (as Iris): "Because you're the Flash, Barry." Cisco and Iris report back to Team Flash about Zombie Tony. Harry mumbles about history repeating itself. Joe convinces Harry that Henry will look after Jesse while he helps them with Zombie Tony. Harry agrees and gets to work. (Team Flash, huzzah!) Zombie Tony wanders around Central City, attacking random things. Meanwhile, Harry hooks Cisco up in the containment cell and has him vibe to open a breach and bring Barry home. Cisco vibes. While Barry talks to Iris, a lightning storm appears nearby. Cisco sees Barry through the lightning storm. He holds out his hand and calls to him. Barry asks the Speed Force if he can go back. Iris--the Speed Force--says yes, but if he goes now, he will go without his powers. The shadow flashes by. Barry turns from Cisco and chases after it. Iris and Henry come in and stop Harry's experiment, pulling Cisco out of the vibe. Defeated, Cisco tells them he saw Barry, but he lost him. (Poor Cisco. Somebody give him a hug! Iris! Harry! Anybody?) They get an alert that Zombie Tony trashed Jitters. They realize Zombie Tony is after Iris again, and he's following the same path he did the first time around. Iris volunteers to be bait to catch Zombie Tony so Cisco can kill him again, since they know where he will go next: the West house. Barry runs and runs until he ends up in a cemetery and meets Henry, who is actually the Speed Force again. Barry is once more angry. He yells at the Speed Force, who responds calmly and shows him a grave that reads "Nora Allen." (This is so sad.) 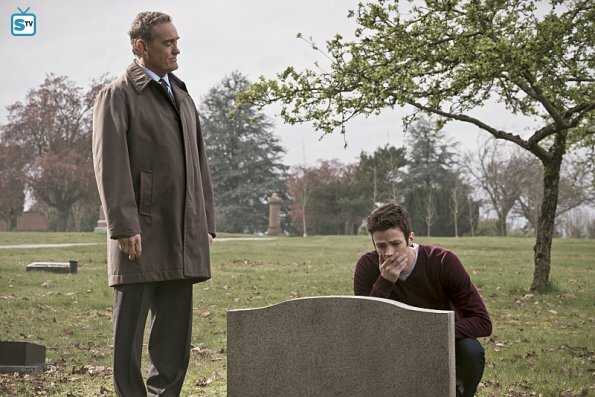 The Speed Force asks Barry if he has truly accepted that his mother's death was the best choice. But instead of answering, Barry ignores the Speed Force to chase the shadow again. Joe, Iris, and Wally stakeout at home. Joe asks Wally if he's feeling okay. Wally says he's tired but fine. Joe drops a mug on the floor to see if Wally reacts, but Wally does not exhibit any speed force abilities. (Darn!) Then Zombie Tony arrives as predicted. Iris goes out to meet him. She leads him to STAR Labs where Cisco has been preparing a machine that will stop him. Zombie Tony enters, Cisco blasts him, it doesn't work, and they run. (Typical, really.) Henry and Harry have taken Jesse to the safest place in STAR Labs, which happens to be where the particle accelerator containment cell is. Joe, Iris, and Cisco come to hide also, but the door isn't that strong, and Zombie Tony will eventually get through. Iris volunteers to lead Zombie Tony away so everybody else can escape and figure out another way to stop him. Cisco wonders if Barry didn't come back because he didn't want to. Barry chases the shadow to his home. His mother sits at the dining room table. (Ow! Why? Why?!) He says she's not his mother, but when she tells him to sit down, she does. He admits he hasn't accepted his mother's death was the correct choice. She says he has to find a way. What he has become is a miracle, but it won't keep bad things from happening. Barry falls apart. (I fall apart.) Barry cries. (I cry.) Barry says he misses his mom. (I say I miss my--no, wait.) The Speed Force tells him that his mother is proud of him. Everybody hugs everybody. Things are great. People are smiling. Then, Zombie Tony attacks the door again. Cisco gives Barry a very quick, very hilarious rundown of what has happened since he disappeared into the Speed Force. They form a spontaneous plan just as Zombie Tony breaks down the door. Barry grabs Iris and speeds her to the other side of the door. Then, he lures Zombie Tony through STAR Labs and back to Cisco's lab. Cisco and Harry rig up a new machine to stop Zombie Tony, but they need more time. Barry fights Zombie Tony to distract him, but Zombie Tony is made of metal, and he's very angry, so Barry kind of gets pummeled. So instead, Barry runs around him, creating a lightning whirlwind. This messes up Zombie Tony's metal, and he passes out. Ta-da! Harry sits by Jesse's bedside. Barry comes in and sees her. He goes to her and touches her hand. A zap of lightning zips between their fingers. Jesse wakes up. Barry: "The truth is, Iris, I don't know what this is or where we go from here. All I know is you're everything to me, and you always have been. And the sound of your voice will always bring me home." Overall, this episode was pretty wacky. It wasn't at all like I was expecting. (I had thought Barry would end up in multiple Earths or something.) It wasn't necessary bad, just weird. The Speed Force being an entity that calls itself "we" and talks about being at the beginning and end of time was just... bizarre and a little uncomfortable for me. But this episode also had a lot of touching moments for Barry. Who knew a superhero show could be so moving about family? I'm actually terrified about Zoom now. What did you think of "The Runaway Dinosaur"?